Fragrance is one of the most widely used of all beauty products, maybe because quite simply it is one of the easiest way to lift your spirits, change your mood, enhance a feeling of wellbeing or simply just to ensure you feel luxurious. Very few people don’t enjoy some form of scent from perfumes for body or hair, to home fragrance via candles and diffusers. If you are truly a fragrance lover you will be aware of the massive impact the world of niche fragrance is having on the industry, you will also be aware of Harrods perfume salon which stocks some of the finest fragrances the world has to offer. However there is a new kid in town! If you want to have a truly explosive experience with scent, an experience where you will find fragrances you may never have even heard of before or want to explore that ‘new find’ then may we kindly suggest you head for the new Jovoy store in Conduit Street London. 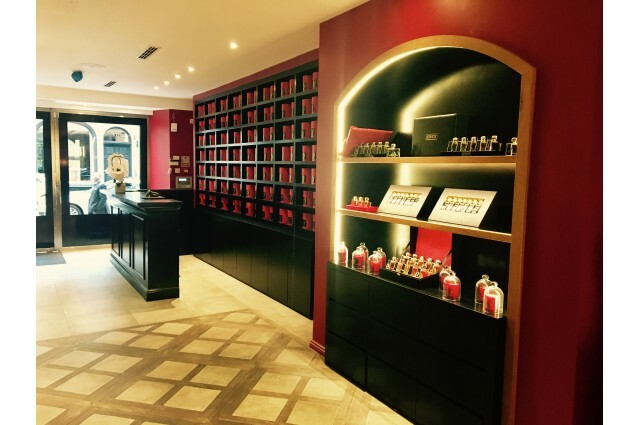 The boutique specialises in rare scents, as well as the company’s own perfumes. Niche brands including brands which haven’t been available in the UK before. This makes it a must destination store; from boutique brands like the British Grossmith London to Paris/Indian inspired brands like Neela Vermeire Creations or Jacques Fath, Parfumeur du Monde, Widian, Arty Fragrance, Fragrance du Bois and SO many more this store is sublime. It feels almost womb-like with its deep reds accented with black all set off the elegant wooden tables that showcase the array of delights available. It’s like walking into the most precious of places which provide a playful yet intoxicating room of pleasure. Jovoy, the Parisian fragrance house, was in fact founded in 1923 by Blanche Arvoy and acquired in 2006 by François Hénin, and this is not an usual story as this is a similar pattern with certain niche brands that have been rescued by perfume lovers. So if you really enjoy the art of fragrance and fancy getting lost in deep sensual experience head to the store and immerse yourself into a sheer pure cocoon of utter joy. However if you have not ever had the experience of fine fragrance then make a trip to the store as a must and learn the joy of scent. Jovoy Mayfair 21 Conduit Street, London W1S 2XP.